Harry (Apex, NC, United States) on 1 March 2019 in Cityscape & Urban and Portfolio. These chairs and cabinets were in a small anteroom right off the corridor and immediately outside a small office with a business size desk. 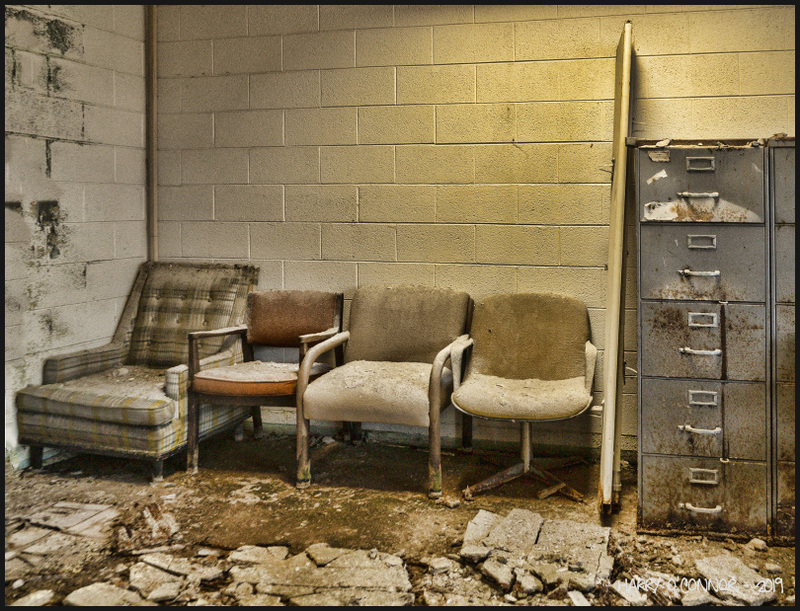 I can imagine students sitting in these chairs, perhaps sent from their classes for misbehavior, waiting their turn to hear their punishment. no thanks, no way, I prefer to stand up than sit on one of these seats. I like the urbex because I really did a lot in the recent past. Beautiful framing to show this decadence. Yes, the chairs outside the prinicipal's office. I don't think they were any more comfortable for those poor students than they look today. Must have looked beautiful and fully active in its hey days !! How sad this looks now !!!!!!!!!!!!!!!!!!!!!!!! Quel laignement d'anciens canapés et ce buffet génail. Just sitting there would be punishment. Cool shot. Cela sent la déshérence et l'abandon des Hommes! Effet bien rendu et cadré!